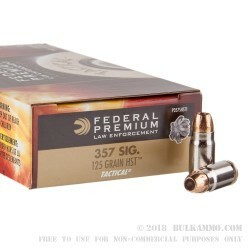 Federal Tactical .357 SIG comes equipped with a 125-grain HST jacketed hollow point projectile and is loaded into boxer-primed, noncorrosive, nickel plated reloadable brass casings. 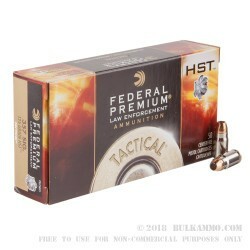 This pack contains 1000 rounds of HST .357 SIG. The HST round from Federal, is the ultimate design in hollow points, and has performed consistently through FBI test protocols for reliability and performance. Searching for a way to have ultimate expansion without sacrificing penetration, Federal developed a projectile capable of expanding into large petals, which allow for less resistance once hitting the body. 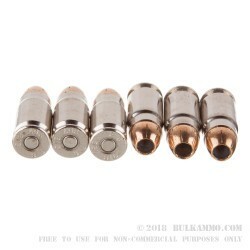 These pre-skived rounds have a mechanically locked jacket to the core, making for maximum weight retention as the copper jacket and lead core will not separate-- while the unique petal design maximizes internal damage. Federal Ammunition, based in Anoka, Minnesota, is a world leader in ammunition production. Using cutting-edge technology, they remain at the forefront of ammunition technology and are trusted by professionals and civilians worldwide, for defense of their home, target shooting or for nabbing that trophy buck this season.